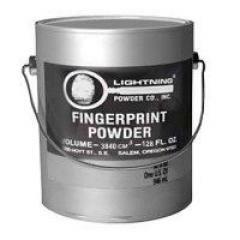 Lightning Powder 1-0054 128oz. Redwop Fingerprint Powder FREE SHIPPING! Redwop® and Greenwop® fluorescent powders have a Lycopodium base and were developed specifically to be luminescence-excited by relatively monochromatic light sources emitting blue-green light. They all work very well with argon ion, copper vapor and Nd:YAG lasers, and they can also be used successfully with simple ultraviolet lamps.. It is recommended that a feather duster be used to apply these powders. The feather duster applies the powder in a thinner, more controlled layer than other types of applicators. Having the widest range of sensitivity, Redwop® fluorescent powder is recommended as a primary use fluorescent powder for examination of latent prints with portable lasers, Forensic Light Sources and ultraviolet light sources. ©2002-2019 CopsPlus.com: Lightning Powder 1-0054 128oz. Redwop Fingerprint Powder FREE SHIPPING!